Let me tell you a little bit about the home of Taste the Cracklin Hog Roast , Truro is a city of over 16,000 trurorians in the South West of England in the beautiful surfers and seaside lovers County of Cornwall. With its ancient cobbled streets, cathedral and delightfully named short cut ‘Squeeze Guts Alley’ there has been a town here since the 12th Century. Truro is a traditional tin mining town that has partly thanks to us deferred from its easy-to-handle-without-poisoning-yourself-lunch-in-a-mine cornish pasty roots to a new hot crackling covered treat, the hog roast! We decided to start a hog roast company in hog roast Truro many years ago after travelling around Australia on a working holiday visa, a modern young person’s equivalent of the 17th Century ‘grand tour’ but on a slightly cheaper scale. It was here in Perth in Western Australia that we came across a large organised beach party with an unusual catering twist….a huge hog roasting on a spit roast machine nestled on the sands, the smells, the drama and fun of the event really stuck in our minds after we had returned to the UK and we looked into whether there was anything similar over on these shores. It seemed while we had been away travelling the concept of hog roasts and spit roasted meat in general was in its infancy in the UK after other travellers to Australia had too seen and loved the idea. There was still plenty of scope and market for the idea of a business as it was still quite rare and Cornwall seemed the perfect location as it is I believe the UK’s answer to Bondi Beach, and so Taste the Cracklin was born! As the business has grown and developed over the years we have catered for many different events such as wedding receptions, anniversaries commercial parties and even more popular than ever is the hiring of our spit roast machines to hold your own unique occasion with yourself a the chef. Especially if you are a pub or restaurant thinking of doing something different this Christmas a Taste the Cracklin hog roast hire in Truro for that works Christmas party or family gathering could be perfect picture the snow falling and everyone outside wrapped up warm sipping hot mulled wine and warm spiced cider in their gloves feeling the warmth from the hog roast and waiting in anticipation of that first bite into a pork roll with apple sauce – yum! It really gets me in the mood for winter. We will provide the machine, very high quality local meat of your choice, gas and a display on how to roast to perfection and it works out incredibly cost effective to achieve. A recent triumph for Taste the Cracklin was an event at a surfer’s festival on a local beach at the south coast. 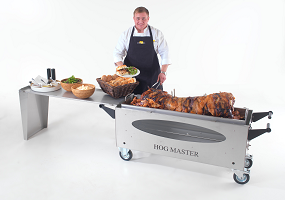 We were hired to provide several hog roast spit roasting machines with different meats such as turkey, chicken, lamb and sirloin of beef to suit everyone’s taste, but to be honest the piggy usually reigns as the most popular. The client opted for a bread roll option and also sliced meat if favoured on the night with several side dishes all chosen by them personally as their own input into the menu was important and fine by us, the more out-there the more interesting as far as we are concerned. Gazebos were hired from us just in case but fingers and trotters were crossed that the weather would rival that of surfers paradise in Australia. A well stocked bar of Fosters was also supplied with staff our staff dressed to impress for the occasion in board shorts, bikinis and cork embellished sun hats which no true Aussie worth his salt would actually admit to wearing. There were several surfing competitions in the sea with beach dudes and babes pitted against each other showing off the tubular skills and working up an appetite for something hot and meat filled. The gods were on our side and the sun blazed in the sky all day and made for a lovely warm evening scented by cooking meats and the sound of the waves crashing onto the sand and revellers teeth crashing into the thick pork crackling – heaven! The tea lights in jars twinkled after sunset and live bands played late into the night with festival goers dancing on the beach. The piggy was picked at until well after midnight and did wonders for soaking up all the XXXX and Carlton Cold consumed during the festival.